Jim Murdock is an experienced higher education administrator with substantial financial acumen gained over 40 years of diversified management positions in central administration and academic units. He has served multiple terms as a Board Member and Treasurer for the Society for College and University Planning, and was the 2004 recipient of SCUP’s Distinguished Service Award. He retired from the Ross Business School of the University of Michigan in 2010, but has continued work in educational organizations since then including two assignments as an Interim CFO. Murdock is currently on a two year assignment with the Registry of Peabody, Massachusetts as the Interim Vice President for Finance and Administration of Marygrove College in Detroit, Michigan. In that role he is the chief financial and administrative officer for the campus supervising the units of finance, business operations, budget, human resources, facilities management and public safety, and information technology. Murdock has been an integral collaborative participant in an institutional transition that had to terminate the undergraduate programs of the institution and manage a downsizing of both faculty and staff. The resulting organization has enhanced financial stability and a balanced budget. He worked closely with a national foundation to obtain crtical operational funding to sustain the college until its reorganization was accomplished. In addition to his operations experience and skills as a financial planner and administrative manager, Murdock has led capital planning projects resulting in the construction of a classroom-laboratory building and parking structure for the University of Michigan-Flint campus and Sam Wyly Hall, an office/classroom/hotel facility for the UM Business School. He participated in the design, financing, and construction of the $145M classroom/administrative/faculty building of the Ross School of Business. As the chief budget officer for the Business School for 25 years, he was responsible for the budget planning and stewardship of $130M in operating funds and $35M of endowment assets. Murdock is a collaborative financial manager who was a key participant in the design and transition of the UM budget system from a traditional incremental model to a responsibility centered management process in the early 90s. He also chaired a university-wide Human Relations task force that initiated a restructuring of the UM staff classification and compensation system. He led the start-up operations of the William Davidson Institute, an independent 501c-3 organization focused on actionable business and public policy initiatives in emerging market economies. Early in his career, Murdock participated in a consulting project with the Phelps-Stokes Foundation that visited several of the historically black colleges to perform a management inventory for institutional assessment and administration improvement projects. His knowledge of federal student financial aid programs led to consulting engagements leading to the growth and development of the campuses of InterAmerican University of Puerto Rico. 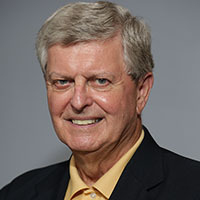 Murdock received his BA in economics from Muskingum University and his MBA in accounting from the Wharton Graduate School of the University of Pennsylvania. He completed all of the doctoral coursework at the Center for the Study of Higher and Postsecondary Education at the University of Michigan. He has taught introduction to accounting courses for several institutions, and has a reputation for making complex financial matters understandable by non-financial colleagues. Jim and his wife Lori live in Brighton, Michigan and are the proud parents of five college graduates. It is rumored that all were required to learn the words of the Victors before attending kindergarten.